No. 46 East 74th Street was one of eleven identical Italianate brownstone rowhouses erected by developer Melville J. Scholle in 1870. Four stories tall above a deep English basement, the handsome house was designed by brothers David and John Jardine. The men would be highly active in the development of the Upper East Side throughout the rest of the century. The house was first owned by the Hazelhurst family and it would quickly be the scene of intense sorrow. Little Charlotte A. Hazlehurst, the eldest daughter of Thomas and Mary, was two years old when the house was built. She died there on February 22, 1873 at the age of five. Friends and family filed through the crepe-draped door the following Saturday morning for the little girl’s funeral. Thirteen years earlier, in March 1860, British-born Isaac Phillips and Adeline Cohen were married by the bride’s father, Rev. Hartwig Cohen. Not extremely long after Charlotte Hazelhurst's death the couple moved into No. 46 East 74th Street where their family would eventually include eight children. Phillips was a wholesale fur dealer at No. 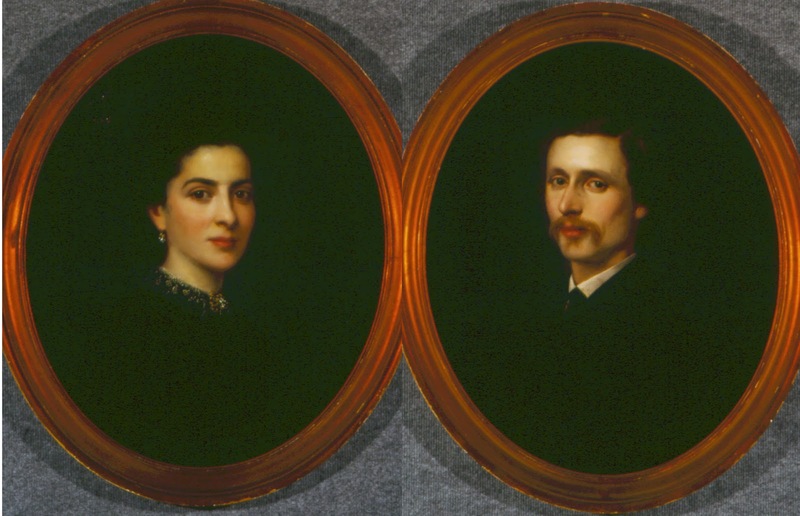 60 Broadway and was wealthy enough not only to afford a comfortable brownstone; but to have wedding portraits painted. By 1877 son Samuel Mendes Phillips was attending New York City College. Of his successful siblings, Jacob Campbell Phillips would go on to study art at the Metropolitan Museum of Art School, the Art Students League, and in the private studio of William M. Case. Naphtali Taylor Phillips would later become Deputy Controller of New York City. Before long the house was home to the unmarried invalid, Julia Sand, who lived here with her brother. When President James A. Garfield was shot on July 2, 1881, Julia was overcome with concern for the Vice President, Chester A. Arthur, who lived in New York near Gramercy Park. Although the two had never met, Julia sent encouraging messages to Arthur. One read in part “Disappoint our fears. Force the nation to have faith in you. Show from the first that you have one but the purest of aims.” Arthur so appreciated her voluntary counsel that he paid a surprise visit to the house. Within the decade the house passed on to George Hillard Benjamin, a patent attorney with offices at No. 45 Broadway. Benjamin and his wife, the former Jane Seymour, had three daughters. Like all wealthy socialites, Jane entertained often. Such was the case in April 1896 when “Mrs. George Hillard Benjamin and Miss Benjamin of 46 East Seventy-fourth Street have sent out cards for a reception for April 30,” as noted in The New York Times society columns. Jane Benjamin would not live past the age of 46. She died in the house on Sunday, October 24, 1897. Her funeral was held in the house two days later. A socially high-profile event would take place in the Benjamin parlor on November 7, 1900 when daughter Mary was married to Henry Huttleston Rogers, Jr., the son of immensely wealthy oil tycoon. Cherie Burns, in Searching for Beauty: The Life of Millicent Rogers, says Mark Twain sent a note to Mary that read “Dear Miss Benjamin, I feel a deep personal interest in this fortunate marriage because I helped to rear Harry Rogers and make him what he is.” He joked that he had considered sending her diamonds, but could not find any fresh ones in this year’s crop. 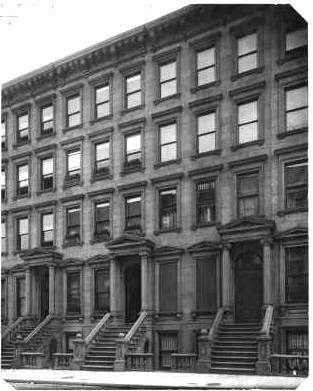 The following year on May 7 the Benjamin family sold the 74th Street house to Melville J. Scholle. As it had been previously, the title was put in the name of Scholle’s wife, Jennie. A wealthy broker and member of Scholle Brothers, Scholle would also take on the responsibility of Secretary of the Beth Israel Hospital Dispensary. By the time the Scholle’s took possession of the house, the block was undergoing rampant change. New homeowners were razing or remodeling the old brownstones into up-to-date mansions. A year earlier the Scholle’s next door neighbors, the Ehrenreiches, became involved in an ugly court battle when Frank Froment remodeled the house on the other side, No. 50. Moses and Hannah Ehrenreich took Froment to court over a matter of 4 inches of party wall. It was an object lesson, apparently, for Melville and Jennie Scholle. Within a month of purchasing No. 46, the Real Estate Record & Builders’ Guide noted that the two families had come to an agreement about their party wall. That having been settled, Scholle went to work demolishing the old brownstone. He commissioned Robert D. Kohn to design a modern home with all the conveniences of an Edwardian residence. Kohn produced a Beaux Arts beauty of red brick and limestone. The bowed lower three floors featured a second floor balcony accessed by French doors. Above the large third floor balcony, the upper two floors could arguably called more English than French, rising to a dignified classical pediment. By January 11, 1902 the Record & Guide announced that the $25,000 structure was “ready for roof.” Ten months later Julius F. Munckwitz, called by the periodical “the long-established and reliable painter and hardwood finisher,” had completed the interior work on the mansion. Jennie Scholle was actively involved in charities, among her favorites being the Stony Wold Sanatorium. The facility in the Adirondacks was “for the care of women and children suffering from tuberculosis in the incipient stage,” according to Health News in February 1915. 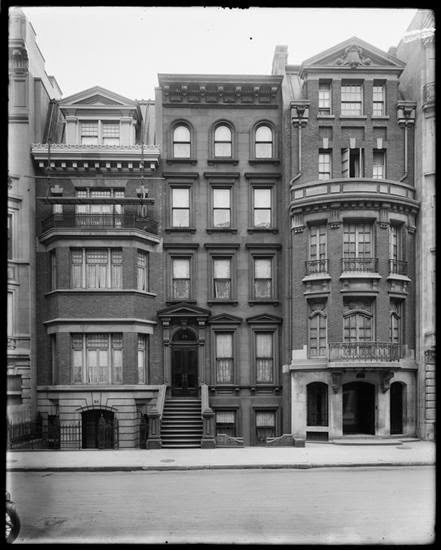 By the time the Scholle family moved into the East 74th Street house the children were growing up. The family traveled to Berlin during the summer of 1909 where they visited Melville Scholle’s brother, Gustave, the Third Secretary of the American Embassy. Only a matter of months later, in January, the engagement of Mildred to Joseph Sidenberg was announced. The wedding took place in March 1910. When World War I erupted in Europe, Robert Scholle enlisted with the American Ambulance Corps and in 1918 he was stationed in France. By the time he returned to New York, the Scholles would be living at No. 55 West 55th Street. Early in July 1919 the No. 46 was sold to Charles Sprague Sargent, Jr. for $100,000—about $1.25 million in today’s dollars. Sargent had married Dagmar Wetmore seven years earlier and was a member of the brokerage firm Kidder, Peabody & Company. The Sargents would not stay long in their new home. On November 11, 1922 The Record & Guide reported that another moneyed stock broker, Henry L. Finch, had purchased the house from Sargent. Finch was married to Mary Farquhar Baker, the daughter of fabulously wealthy banker Stephen Baker. Within the year Mary and Henry would welcome a fourth son into the family, both in the house in June 1923. The birth did not prevent the couple from boarding the steamship Paris on August 11 that year “for a trip abroad,” as reported by The Times. Two months, on October 29, they returned on the Majestic. Like Jennie Scholle before her, Mary Finch had a pet charity. On May 14, 1929 the New York Evening Post described her as “one of the attractive women in the younger married set who devote a large part of their time to charity. She is especially interested in the House of Rest and she is president of the Junior Auxiliary of that institution. Mrs. Finch, who is an enthusiastic horsewomen, will spend the summer in Red Bank, N.J.” In fact, year after year newspapers would report on Mary’s activities in organizing the annual Butterfly Ball held by the Junior Auxiliary of the House of Rest. The Finches would remain in the house through the 1950s as one-by-one the sons married and left home. For several decades beginning in the mid-1960s it was the Permanent Mission of the Republic of Ivory Coast to the United Nations. Today Melville Scholle’s handsome Beaux Arts mansion is little changed on a block that, for the most part, is an amazing time capsule of Edwardian mansions.